Wow. This book was deep. Large chunks of it probably went sailing right over my head, but at the same time it was very readable - possibly because the author, despite obviously being very knowledgeable in things like philosophy and physics, made the whole thing very personal. 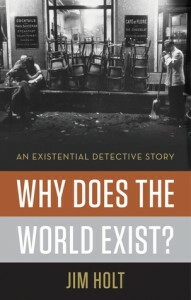 It really was like a detective story, as he traveled the US, Canada and Europe interviewing experts in various fields (philosophers, physicists, theologians) about the mystery of existence. I'm not convinced that any of them, including him, has got the answer, or that there is an answer, but he certainly made me think.